Chasing the best picture quality is still important. While many people are content to watch things on their phones, there is still a strong group who are really dedicated to improving the viewing experience. If you’re one of those people or thought you might want to be one of those people, here are some ways you can get the best quality from what you’re watching. Right now as I write this, the best quality picture comes from Ultra HD Blu-ray disc. This is a technology that provides 4K over physical media similar to the DVDs you gave up several years ago. You can get standalone players fairly cheaply now or you can just break down and get an Xbox One which has the tech built-in. There’s a fair amount of content out there, of course it’s nothing compared to what’s available on streaming. When it comes to picture quality, DIRECTV 4K is going to beat streaming 4K any day of the week. It doesn’t need to be compressed as aggressively and you’re going to get a beautiful picture. Of course you’ll need DIRECTV service to get it. This is the only place to get 24/7 4K live content, as well as an extremely decent collection of movies on demand. Be aware that the on-demand programs can take a long time to download because they always download in full quality. If you’re really searching for the best quality, you’re going to want to hold onto that physical media. Even though 4K has double the resolution of Blu-ray disc, the Blu-ray disc often looks better thanks to the high-bitrate encoding it uses. 4K over streaming is often a disappointment, with quality levels that fluctuate and an overcompressed picture that makes grain seem patchy and blurry. Luckily choosing a good TV today is easier than ever. There is a great selection of TVs in the $600-$1,000 range that easily outperform a $20,000 TV from just a few years ago. If you really want the best of the best, you’ll want to look into mainstream manufacturers like LG, Sony and Samsung. They all have premium lines that promise the absolute brightest, sharpest, and most contrasty picture you can get. You’ll pay between $2,000 and $3,000 for the top of the line in a larger TV. Of course all these TVs today are 4K and HDR, that’s sort of a minimum price of admission for any TV over 40″. 8K TVs are just over the horizon they say, but for now there’s no reason to shell out the money for one. They’re evolving fast and I’m sure that once the features are all sorted out they’ll drop in price quickly. The real reason to stay away: there’s absolutely zero 8K content right now. How far away you sit is really important. Too far from a smaller TV and you’ll miss out on quality. The best chart I’ve seen to demonstrate this comes from AVS Forum user “Randomoneh” and I’ve included it here so you can see it. 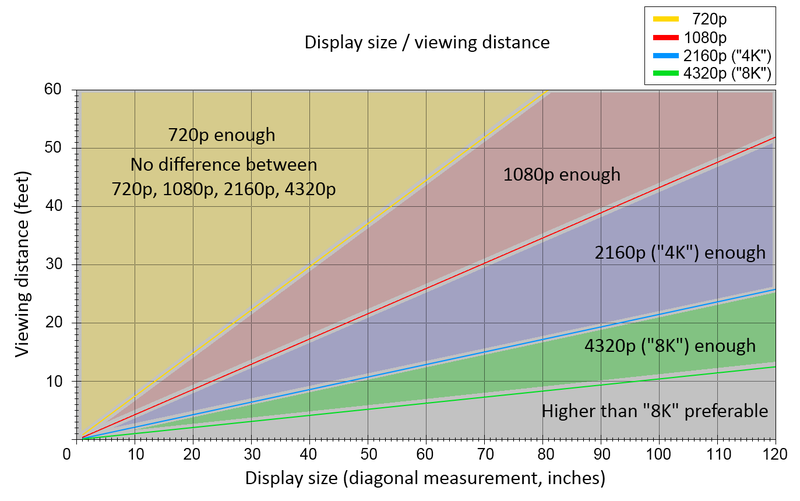 What you see is that as you get further, you’ll need a bigger TV to appreciate the quality difference. Here’s a simple example. If you have a 40″ TV and you’re 10 feet away, that’s the point where an 4K TV is right for you. If you get up to 60″ you’ll see the difference with an 8K TV and at the same distance your 100″ TV will start to seem a little blurry even at 8K. Look at it a different way: If you’re 20 feet away looking at that 40″ TV, you would be hard pressed to tell the difference between HD and 4K. Of course this chart doesn’t really fit everyone. It depends on your age, for example. Studies have shown that most people over 50 tend to see worse than younger people, and that can skew the chart. It also doesn’t really take into account visual field. That’s the measurement of how much space that screen takes up when you’re looking at it. If you go to the movies, the screen takes up about half of your visual field, while a 50″ TV from even 10 feet away takes up less than one-quarter. If you want a truly theatrical experience, you’ll want a much bigger TV, even if it’s a little blurry. There’s a real backlash right now against what’s often called the “soap opera effect.” Most modern TVs refresh the picture faster than the video content is shown. For example, theatrical releases are often at 24 frames per second while videos are at 30 or 60 frames per second. Most TVs refresh at 120 frames per second and some go to 240 frames per second. Most TVs will fill in those extra frames with computer-enhanced versions of the video. This has a tendency to eliminate blurriness and make everything seem very, very sharp. It’s called the “soap opera effect” because soap operas are shot under bright lights using video cameras. A lot of purists will tell you to turn off “Pure Motion,” “Auto Motion Plus,” “True Motion,” or whatever your TV calls it. They’ll also tell you to turn off things like blur reduction, shake reduction, or any of those extra features you find in the “Advanced” menu of your TV. And I’m here to tell you, it’s your TV so do what you want. Personally I’m not put off by the “soap opera effect.” Sometimes I do get distracted when very fast motion seems to make objects appear twice or three times next to each other, but that’s rare with today’s TVs. I have no problem with reducing blur and making action seem more realistic and present. So I keep all that stuff on. My point is that it’s completely up to you. Finally, make sure you’re using the right accessories. Use bias lights to make sure you’re watching in the right environment. Use high quality cables that are rated for 4K. Mount your TV at a good height that’s comfortable to look at. And of course, shop at Solid Signal for everything you’ll need!